It didn't take me more than a chapter for me to become fully engrossed in Walk on Earth a Stranger. I love westerns, which is what immediately drove me to pick this one up. I'm also a fan of the girl-disguises-herself-as-a-boy trope, so that drew me in as well. It reminded me a lot of Vengeance Road in that way, one of my favorite books which also takes place in a western setting and involves a female character dressing as a boy in order to blend in as she sets off on a journey across 1800's America. The book pretty much starts off with a bang, getting right into the suspense and action as Leah is forced to flee her home from a greedy uncle who wants to control her for his own selfish needs. Although she spends a good quarter of the book traveling alone and trying to catch up to the one person left in her life whom she can trust, she eventually becomes part of a group of all different types of people all headed towards the promise of gold in California. I was a bit surprised that the majority of the book centered around Leah and her travel companions journey across America to California. The entirety of Walk on Earth a Stranger focused on the obstacles and complications that one would expect to see in a wild west novel-bandits, rough terrains and harsh traveling conditions, meager supplies, near deaths and ultimately, a journey of both physical and mental strength. I thought Leah's ability to sense the presence of gold would come into play a little more. I presumed it to lend a little more of a fantasy element to the story. I love stories of survival and harrowing expeditions though, so I didn't consider that to be a huge disappointment. I had no idea that the people Leah met along the way would become such important characters in her story! I assumed the focus would remain solely on Leah and her childhood friend Jefferson, so I was pleasantly surprised that Leah made so many new companions on her journey. There were so many great characters we got to meet who turned out to be a lot more likable and a lot more significant to the story than I would have guessed. Jefferson, though, was my favorite. Although the romance isn't huge in this book, it's obvious that the two of them have romantic feelings for one another. It's very subtle and very slow burn and doesn't fully develop, but this is book one in a trilogy so I'm excited to see their budding romance blossom even more in the second and third books. Jefferson could be a little gruff at times and it was hard to get a read on him during some of his and Leah's interactions. Maybe it's just cause he's a bit of a closed book but he was kind of hard to understand and sometimes I found myself wishing he'd show more emotion. The emotions he showed most frequently were probably anger and annoyance, like anytime he had to endure racist and ignorant comments regarding the Indians and people who shared his heritage. I felt myself getting frustrated on his behalf because he felt like he had to prove himself to be a good person with everyone judging his entire race on the actions of a few. This was common during those times of course, and unfortunately still is today, and I was glad to see Rae Carson address it and make one of the main characters Native American. Overall, both Jefferson he and Leah grow so much throughout all the hardships they endure together and I'm hoping we'll get to see even more character development as the series continues. 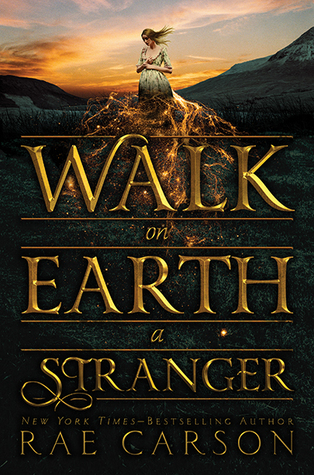 Sign into Goodreads to see if any of your friends have read Walk on Earth a Stranger.